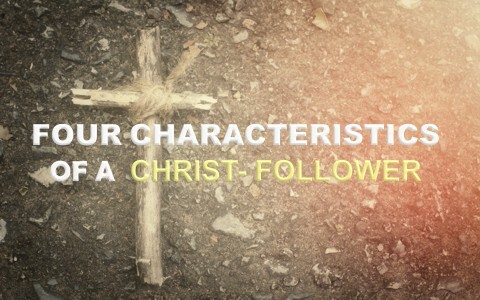 What are four characteristics of a Christ-follower? When Jesus was choosing His disciples, the first thing we should notice is that He chose them and not them choosing Him. Jesus told the disciples, “You did not choose me, but I chose you and appointed you that you should go and bear fruit and that your fruit should abide, so that whatever you ask the Father in my name, he may give it to you” (John 15:16), and this is much of the reason the world hates us, but “If you were of the world, the world would love you as its own; but because you are not of the world, but I chose you out of the world, therefore the world hates you” (John 15:19). A lot of people say they are Christian, but how many are willing to follow Him and do what He says? Jesus said, “If anyone serves me, he must follow me; and where I am, there will my servant be also. If anyone serves me, the Father will honor him” (John 12:26). The fact is, none of us seek after God on our own (Rom 3:11), because dead men’s bones can do nothing (Eph 2:1-5), so it is God Who seeks after us (John 6:44). Even so, some make excuses, like when Jesus said to one man, “Follow me.” But he said, ‘Lord, let me first go and bury my father’” (Luke 9:59), so “he said to all, ‘If anyone would come after me, let him deny himself and take up his cross daily and follow me. For whoever would save his life will lose it, but whoever loses his life for my sake will save it’” (Luke 9:53-54). The man was probably waiting for his father to die so he could receive his inheritance, so this man was not willing to deny himself or his inheritance, therefore, this man was not worthy to be Jesus’ disciple. A true disciple follows Jesus, no matter the cost. The Apostle Paul wanted to know Jesus Christ so passionately that he was willing to enter into His sufferings, because you cannot know Christ until you suffer like Christ. Of course, our suffering will not be to the extent of Jesus’ suffering (Isaiah 53). Paul’s desire was to “be found in him, not having a righteousness of my own that comes from the law, but that which comes through faith in Christ, the righteousness from God that depends on faith” (Phil 3:9), but it was so “that I may know him and the power of his resurrection, and may share his sufferings, becoming like him in his death” (Phil 3:10). A disciple is not above His master (Matt 10:24), and so “if children, then heirs—heirs of God and fellow heirs with Christ, provided we suffer with him in order that we may also be glorified with him” (Rom 8:17). Paul almost writes as if, we are His children and heirs, “provided we suffer with him.” It’s not that our suffering makes us into the children of God, but the children of God will quite naturally suffer like the Son of God did, but the good news is, this suffering of ours is so that “we may also be glorified with him!” Want to know Christ better? Then learn to suffer as He did. He suffered for telling the truth, for exposing the self-righteous Jews, and for making Himself equal with God (as He is). Many people say they want to know Christ better but are not willing to suffer for His name’s sake, however, the real question is not whether you know Christ, but whether He knows you (Matt 7:21-23). Jesus didn’t save us to sit and stew and be pew potatoes and be like sponges…soaking everything up, but rather, He called us to go into all the world with the gospel, making disciples of all nations (Matt 28:18-20), but also to do good works for Him that God has appointed for us to do (Eph 2:10). Jesus puts Himself in the place of those we serve, saying, “For I was hungry and you gave me food, I was thirsty and you gave me drink, I was a stranger and you welcomed me, I was naked and you clothed me, I was sick and you visited me, I was in prison and you came to me” (Matt 25:35-36). But the righteous, or the saved will say, “Lord, when did we see you hungry and feed you, or thirsty and give you drink? And when did we see you a stranger and welcome you, or naked and clothe you? And when did we see you sick or in prison and visit you?’ And the King will answer them, ‘Truly, I say to you, as you did it to one of the least of these my brothers, you did it to me” (Matt 25:37-40). When we serve others for Christ, we are serving Christ Himself, and that’s what Christ-followers do. They do what Jesus did. They love one another so that others will know they are His disciples (John 13:34-35), so it’s infinitely more than just saying, “I’m a Christian.” Just about anyone can say they believe in God, and it seems, almost everyone does, but to do things for Christ is the mark of a true Christ-follower, and following the will of God. I love using the moon and the sun as an analogy of our own relationship to Jesus Christ. The moon has no beauty of its own. Without the sun shining on it, it’s a dark, hostile, foreboding planet that is lifeless. It is only when the sun shines on the moon that it is beautiful, so in the same way, the believer is only a reflection of Jesus Christ, and not the source of anything good. Only by God’s Spirit can we do any good for God, so all glory must go to God at all times. We are to be imitators of Christ, and Jesus always sought the glory of God, but what does that look like? He tells us to love our enemies, do good to those who do bad to us, and bless those that curse us (Matt 5:43), and specifically, in speaking to His disciples, or those who desire to be His disciples, “Love your enemies, do good to those who hate you, bless those who curse you, pray for those who abuse you” (Luke 6:27-28), but this is “so that you may be sons of your Father who is in heaven. For he makes his sun rise on the evil and on the good, and sends rain on the just and on the unjust” (Matt 5:45). It’s not that doing these things makes you into a child of God, but rather, the remade child of God will be doing these things. It’s not about doing these as works to be God’s child, but God’s child will do these works to please their Father, and what pleases the Father is to seek to glorify Jesus Christ, however, just as doing good works for others is doing it for Christ, (Matt 25:40), doing nothing for others is doing nothing for Him (Matt 25:41-46). If you want to know Christ, then you must be willing to suffer like Christ. If there is no cost or change in the person’s lie, then they might want to examine themselves to see if they’re truly a Christ-follower (2nd Cor 13:5). It hurts to serve Christ, but even the shame and scorn we face on behalf of Christ results in rewards that will not be lost, and who wouldn’t want a blessing for being a Christ-follower? The Apostle Peter gives us great reasons to endure suffering, shame, and persecution for Jesus’ sake: “Beloved, do not be surprised at the fiery trial when it comes upon you to test you, as though something strange were happening to you. But rejoice insofar as you share Christ’s sufferings, that you may also rejoice and be glad when his glory is revealed. If you are insulted for the name of Christ, you are blessed, because the Spirit of glory and of God rests upon you” (1st Pet 4:12-14). I can’t speak for you, I desire that “Spirit of glory” resting upon me. I can endure insults “for the name of Christ” because I know, I’ll be blessed, but more so, to try and live for Christ, serve for Christ, and glorify Christ is what a Christ-follower will naturally do; not in order to be saved, but because they are saved (John 15:16). They follow Christ and that means they follow what He taught and what He did but suffer as He did. Read this related article: How Do You Know They Are Christian? I always enjoy reading your articles. What I do not like is Amazon’s invading ads. I wish they would stop. They always throw me off the article and I have to start all over. Maybe they are being used by the evil one to interfere with good clean spiritual reading. Hello Donna. I am sorry for the inconvenience of the Amazon ads. Since we do not receive outside support, these keep us on the Internet, but even so, I am sorry they interfere with your reading. Thank you for letting us know. Previous post: How Human Was Jesus?